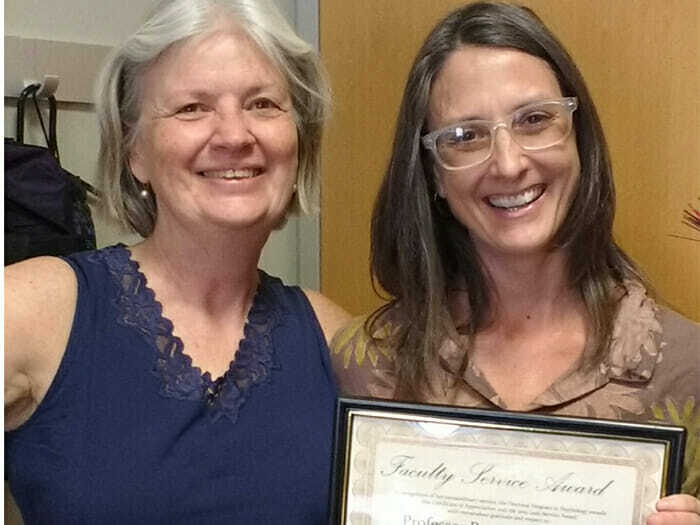 The City University of New York (CUNY) is proud to name Dr. Patty Brooks as the recipient of the first annual “Faculty Service Award” in the Doctoral Program in Psychology. Professor Brooks, who serves as the Director of the Language Learning Laboratory in the Psychology Department, joined the College of Staten Island faculty in 1997. She is currently the first-ever Deputy Executive Officer of Pedagogy and Professional Development in the Department of Psychology at The Graduate Center, CUNY, a position created to support graduate students outside of their doctoral research in such activities as teaching, and community and college service. Professor Brooks is also a faculty advisor to the Graduate Student Teaching Association (GSTA) of the American Psychological Association and has helped CUNY graduate students gain national recognition for their innovative teaching and engagement of students in CUNY classrooms. “I was very surprised and honored to be given this award. It has been great fun to work with the doctoral students in psychology at CUNY and support them as they launch their careers as teachers of psychology,” Brooks commented. “It has been my honor to work with Professor Brooks over the last eight years, and I am exceptionally grateful to her for the countless hours she has dedicated and ideas she has generated to benefit our students,” commented Maureen O’Connor, JD, PhD, Professor of Psychology, John Jay College, and Executive Officer, Doctoral Program in Psychology at The Graduate Center, CUNY. Dr. Brooks is currently working with the GSTA leadership to produce an edited book titled How We Teach Now: The GSTA Guide to Student-centered Teaching to be published by the Society for the Teaching of Psychology in 2017. She has also recently launched PSYCH+Feminism as part of Wikipedia’s Year of Science, an initiative that encourages instructors of psychology courses to incorporate Wikipedia editing assignments in their classes, specifically to address the lack of articles on prominent women in psychology. Dr. Brooks is preparing for the Seventh Annual Pedagogy Day conference to be held at The Graduate Center, CUNY on October 28, 2016, featuring Professor Janie Wilson, President of the Society for the Teaching of Psychology, as keynote speaker. The conference is open to the entire CUNY community free of charge.